The myth and legend of King Arthur has long been a favorite fascination of popular culture, the source of countless novels and movies and the inspiration for an iconic Broadway musical that became the nickname for John F. Kennedy’s too-short inspirational time as American President: “Camelot.” Forget the real-life history, the very mention of King Arthur and the Knights of the Round Table conjures up images and ideals of chivalry and honor, of magic and myth, of the shining light of hope in the midst of the Dark Ages. It’s a rousing tale of a lowly boy rising to become beloved King, a tragic love story, a thrilling adventure and an inspirational spiritual quest to heal the wounds of war and hate by finding the Holy Grail. John Boorman’s magnificent and magical Excalibur is, to my mind, the greatest and the richest of screen incarnation of the oft-told tale. Filmed on the rocky coasts and in the emerald forests of Ireland, Boorman turns this landscape into a primal world hewn out of stone and wood and mud by blood and iron. The primordial quality hits us from the opening scenes, as Merlin (Nicol Williamson), part ancient sage and part court sorcerer, draws the magic out of the dragon that is earth from a Stonehenge-looking monument on a hill overlooking a battleground of clashing knights in armor. It’s beautiful yet brutal and Merlin’s attempts at civilization are thwarted by the primal drives of the primitive Uther Pendragon (Gabriel Byrne), but from his blood and flesh is born the once and future King Arthur (Nigel Terry), raised a squire but destined to be king. This is the Arthur legend at its most primal, romantic and tragic, human and supernatural, set on the cusp between the old gods and the Christian God. Boorman and writing partner Rospo Pallenberg rework Thomas Mallory’s tale into an ur-myth of magic and men in the transformation of the world into the age of mankind’s dominion over the Earth through laws and reason and ideals. Every frame suggests the ancient world of wonder and primeval power; even the Christian wedding of Arthur and Guenevere (Cherie Lunghi) is set in the midst of a forest, the power of nature overwhelming the Christian imagery while the cloaked religious figures look as much like Druid priests as Christian soldiers. It’s also a magnificent blood and thunder tale of men with swords torn between the primal drives of power and lust and the idealism brought to the land by Arthur, the benevolent king who encourages his knights to go forth in acts of heroism and chivalry, with Lancelot (Nicholas Clay, a formidable image of a hero if not exactly an inspiring flesh and blood character) as the paragon of goodness. Which, of course, means that this ideal has the harder fall from his elevated expectations. The performances—or more accurately, the strength of screen presence of many of the leading players—can be seen as the film’s weakness, but they also have the effect to giving us human players thrust into the mythology: mortals with mortal flaws struggling to live up to the challenges of their roles. But not all: Helen Mirren is already more than human as Arthur’s half-sister Morgana (even the little girl who plays the young Morgana, present at Arthur’s conception, is creepy and preternaturally perceptive), “a creature like you,” she insists in a half-hiss to Merlin as she becomes his protégé. And Nicol Williamson hams his lines like an old god reduced to court jester, telling stories to the children that are medieval mankind in hopes of teaching them a little of their potential. Excalibur draws from the wellspring of all mythology and the specific cultural and historical identity of ancient Britain to sculpt this very specific tale of the Camelot ideal. Borrowing music from Wagner’s Ring Cycle only stirs in more mythic resonance, but even without the specific references to the Teutonic myths the music is epic and grandiose, fitting themes for the rise and fall of a king, the tragedy of a benevolent kingdom won and lost and the celebration of the eternal hero(es) rising for one last battle against the forces of darkness. The Warner Blu-ray debut is both exciting and a little disappointing. The image is excellent though not as rich or clear as I thought I remembered from theatrical screenings (from memory, which can be idealized). It’s a dark film, much of it shot in deep forests, some of it at night, and there is strong presence of grain. It’s perhaps appropriate for such an earthy, elemental film to have such roughness (a “thick, gritty appearance,” in the words of DVD Beaver’s Gary Tooze), but I still hold out hope for a freshly remastered edition from original elements and a Blu-ray edition that glows with the magic of Boorman’s vision and Alex Thomson’s cinematography. The disc also features John Boorman’s commentary from the previous DVD release, the sole supplement apart from the trailer. To dig deeper into the myth and cinema of Boorman’s film, read Kathleen Murphy’s reflection on the film here on Parallax View. In the years after World War II, a bunker filled with canisters of film footage was discovered in the forests in East Germany. 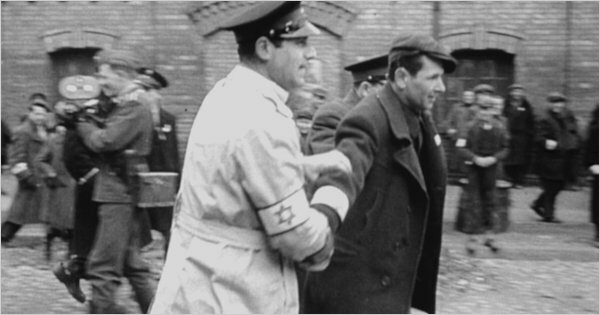 Among the cans of films, documentaries and raw footage was one labeled simply “Das Ghettto, 1942,” containing the rough cut of an unfinished propaganda film shot in the Warsaw ghetto just before the residents (aka prisoners) were rounded up and sent to the death camps. This documentary by Yael Hersonski uses the footage as a starting point to examine the ordeal of the Jews forced to live in the poverty and horror of this urban concentration camp as well as the efforts of the Nazis to create anti-Jewish propaganda. With the help of diaries chronicling the lives of the inhabitants (including a detailed record of the shooting by Adam Cherniakov, the head of the Jewish Council), testimony by the only cameraman to be questioned in the post-war trials and a reel of outtakes that shows the retakes, the manipulations of the direction and, in places, members of the crew caught on film between takes, this documentary dissects a film that was never finished (and whose purpose, while we can guess, we’ll never really know) to reveal the reality behind the construction and the inhuman culture behind its creation. The power of the film is enhanced by it seeming simplicity, pulling together a tremendous feat of research and scholarship and leaving the commentary to the archival witnesses and to five survivors invited to view the footage (“What if I see someone I know?” asks one woman, a question that we not only can’t answer but can’t honestly imagine asking). The more it strips itself to the evidence, its narrator (Rona Kenan in the English language version) simply providing the background, the more devastating and affecting the portrait becomes. The DVD release from Oscilloscope, packaged up in its distinctive four-panel paperboard case in a slipsleeve, features a 14-minute interview with author and film researcher Adrian Wood, a three-minute interview with scholar Michael Berenbaum, the 1945 documentary short “Death Mills” directed by Billy Wilder (which includes footage of the death camps shot after the liberation), a study guide and a short essay by film scholar Annette Insdorf. The film Excalibur did, in fact, have quite a bit of grain to the image, which may be due to the film stock used, or the fact that director John Boorman tweaked the film’s colors to help give a Middle-Earth feel to it. This film remains one of my all-time favorites. The artistry of it, the music, the incredible cinematography, the great acting (Helen Mirren, Patrick Stewart, Liam Neeson all with memorable early film roles here) all combine to make a film that will always be fun to view. Many films from the early eighties have a softer image to them, and they should not be too harshly criticized as less than great transfers when they may in fact look exactly as they did in their initial release. I look forward to getting this film on Blu-Ray, grain and all, still a great work from a talented director!